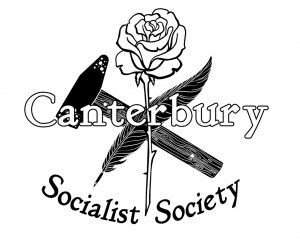 We, the undersigned, declare the founding of the Canterbury Socialist Society on this date 12-09-2018 in Christchurch, New Zealand. To promote and encourage a greater understanding and engagement with socialist theory, politics, and history. To organise and participate in various events, conferences, exhibitions, seminars, and workshops for the exploration of socialist ideas. To work with other individuals and organisations with an interest in socialist ideas in order to provide events and activities to promote engagement with socialist ideas. To develop an organisation based on collegial practice and discussion that can provide a basis for socialist activity where conditions allow. To practically support working class struggle where possible and appropriate. To do all such things as are incidental or conducive to the attainment of the above objects. We take socialism to mean the political goal of bringing the working class to power at all levels of society in order to establish a system where production is organized rationally to meet human need, rather than for the accumulation of private wealth. While attendance and participation in our events is open to all, membership is based on agreement to section “II. Purpose”. Membership grants the right to submit motions and vote on them at any AGM or SGM of the CSS, and to be elected to the Executive Committee. Members will be encouraged to be in discussion with one another, as well as the acting executive, in order to pursue the goals of the Society as well as organise and support its events. Though members are free to be members of other organisations, parties, and similar groups (known as “dual-membership”), any potential conflict of interest that may arise from this situation should be communicated to the Society as soon as possible. Any member who is found to have brought the Society into significant disrepute, or acts with serious misconduct within the organisation may be expelled as a member by a majority vote of the Executive. Any member may challenge the decision to expel a member and a meeting will be called for all members to discuss and vote on expulsion. The Executive Committee shall be made up of members of the Canterbury Socialist Society. The executive shall be a minimum of three individuals and will negotiate collective responsibility on the day to day operations of the Society. The actions and decisions of the executive will be transparent to all members. The Executive shall be elected for one year (12 months) at an Annual General Meeting (AGM) of the Society. The executive may be elected as a slate, or as individuals, and will be voted in by a show of hands. Members may nominate themselves, but must receive one second from another member at the AGM. The Executive is entrusted with the operation of the Society, its funds, assets, and the pursuit of its purpose as defined in this document. The Executive will have regular communication (a minimum of one per month) with all contacts providing updates on the activities and events of the Society. Any member of the Executive, or the entire Executive is subject to a recall vote. Any member may request a recall vote so long as there is one (1) seconder. Request for a recall vote shall be received by written notice, e-mail, or from the floor at any official meeting of the Socialist Society as laid out in section “V. MEETINGS”. The highest decision making body of the Society shall be the Annual General Meeting (AGM). The AGM shall be held in the third quarter of each year. The date shall be decided the Executive Committee who will notify all members for a period of at thirty (30) days beforehand. During the notice period, and up until three (3) days before the AGM, members may submit resolutions to be discussed and voted on. A quorum for the Annual General Meeting shall be eight (8) members of the Society, of which no fewer than five (5) shall be non-Executive members. A resolution put to the vote of the meeting shall be decided on a show of hands. However, if any member demands a secret ballot before a vote by voices or show of hands has begun, voting must be by secret ballot. Every member present shall have one vote. In the event of an equality of votes the resolution shall be tabled for follow up discussion, and a follow up meeting to be set no longer than sixty (60) days after the AGM to reach a decision. The same period of notice for any follow up meeting(s) applies as to the AGM. The Annual General Meeting is also the body which can make changes to the Constitution of the Canterbury Socialist Society. All other meetings of members may make decisions that are deemed to pursue the objects of the society in section “II. PURPOSE”, and change or add to section “VI. STANDING ORDERS”, or to address any formal objection to decisions made by the Executive. These meetings are to ensure continuity and business as usual operations of the Society. We, the members of the Canterbury Socialist Society, hereby provide a mandate to the Executive of the Canterbury Socialist Society, to pursue the following general and specific goals for the next twelve (12) months of the basic operations of the Society. To establish a brief, quarterly bulletin detailing the events and activities of the Society, alongside an editorial perspective and any other items of interest. (Approximately a two-sided A4 sheet, provisionally titled “The Commonweal”). To extend the reach of the Facebook page to 600 people, and the mailing list of supporters to 120. To follow up on any interest in Canterbury Socialist Society t-shirts, including having payment collected and t-shirts distributed. i) The Fred Evans Memorial Lecture. An official ‘high point’ lecture where a speaker, International or Local, is invited to deliver a full length lecture on a topic of import or interest to the Society. Said invitation should include funding, preferably full if not partial, for the speaker. ii) A “State of the Unions” panel with local organisers and unionists in Canterbury. To complete a ‘membership package’ including membership cards, and a copy of “Wage Labour and Capital” for new members. To continue with a minimum of one monthly educational and one monthly social event for the Socialist Society. To maintain our assets, digital and physical. To set up a repository of recordings, available either publicly or for members only based on each speakers’ preference, of the CSS public lectures.